In the hierarchy of fun projects, repairs rank just below practical projects for me. Repairs to practical projects? Oof. In late 2016 and again in mid-2017, I knit wool furniture socks from scrap yarn. I made sets for our six dining room chairs and a set for our sofa. The socks protect our wood floors, and stay in place better than adhesive felt pads. I chose wool because I thought it would be gentle on the floors while also being durable. A chair wearing a sock next to one with a slipped felt pad. This past December, I noticed that the set on one dining room chair was worn through. Thinking the rest of the chair socks were likely the same, I mentally prepared for knitting another six sets. I had knit the original sets from the top down. As I gave it more thought, I realized I could simply take apart and reknit the lower end of each sock. And I was excited to discover that only the one set needed to be repaired — on the chair our children use the most when doing homework. My chore had eased considerably! But our kitchen chairs had begun slipping off their felt pads, as had our coffee table. That’s another seven sets that needed to be knit. The project was squarely back in the chore category. The lighting is different, but the top of this repaired sock is the same. It’s slow-going, but I’ve repaired the initial set and knit three more sets so far. This time, I’m using scrap acrylic yarn. I’m a little nervous that it might be too abrasive for the floors, but acrylics are so soft these days that I’m optimistic. It will be interesting to see if they’re more durable than the wool. Needle Repair Tip — or Needle Tip Repair? 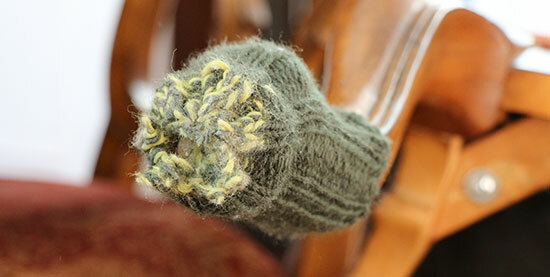 When knitting the furniture socks, I’ve been using worsted weight yarn on US-5 (3.75 mm) double-point needles. I double the yarn at the bottom of each sock for extra durability. Unfortunately, this also puts extra strain on my needles. Have I mentioned that I can be a tight knitter to begin with? The needles I’m using are birch hardwood; a few of them have begun to splinter at the tips and catch on the yarn. Can you see the roughness of the damaged needle tip? Fortunately, wooden needle tips can be easily repaired. I keep a nail file with my knitting supplies, and it works well to buff out those splinters. After I’ve “sanded” the needle tips, I give them a light coat of clear nail polish to protect them against future wear. To ensure the nail polish has time to cure, I like to let the needles rest overnight before knitting with them again. I’ve made it to the halfway point of this practical project, and I’ve salvaged a set of damaged knitting needles. Meanwhile, I’m daydreaming about projects that rank higher on my fun-scale. How do different types of projects rank for you?